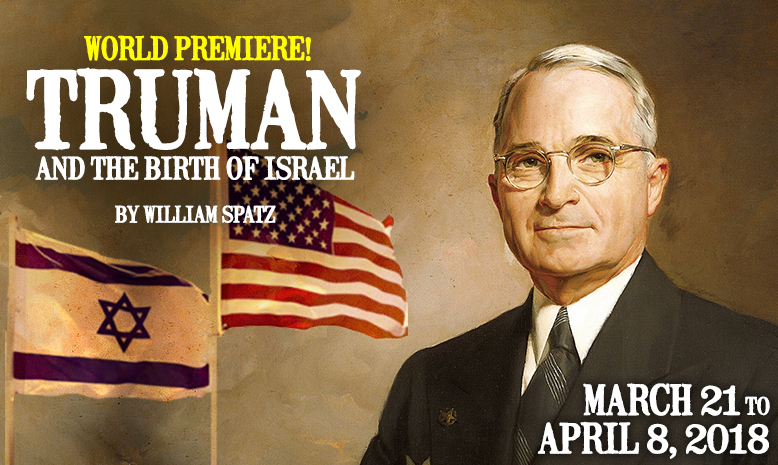 Forum Productions, in conjunction with the Greenhouse Theater Center NFP, is seeking actors and actresses to portray the lead and supporting roles in Truman and the Birth of Israel, a world premiere play by Chicago playwright William Spatz. Auditions will be held on Friday, September 29, from 11 a.m. – 5 p.m. at Mizner Park Cultural Center, 201 Plaza Real in Boca Raton. The production will make its debut on March 21, 2018 and will run through April 8, 2018. Rehearsals start on March 4. From humble beginnings as a poor farmer, soldier and failed businessman to the unimaginable: president and thrust headlong into global turmoil, Truman and the Birth of Israel tells the real story of how one Missouri man’s unlikely rise to power changed the future of the Jewish people forever. The show is directed by Clayton Phillips and produced by Forum Productions, the highly acclaimed comprehensive stage and theater company based in Chicago. The company has produced/co-produced 17 plays including the well-received Churchill and Solo Celebration!, a series of one-actor plays all staged at the Greenhouse Theater in Chicago. HARRY S. TRUMAN: (Equity/Non-equity); 50s – late 60s, 33rd President of the United States; Proper and plainspoken but with a temper, Missouri Midwestern drawl with a blunt, yet folksy disposition. CLARK CLIFFORD: (Non-equity); Early 40s – mid 50s; A lawyer and close friend of Truman’s, handsome, fit, calm and sophisticated. MELVYN BELLI (Non-equity): Late 30s – 50s; An attorney for the defense who is sarcastic, aggressive and incites provocation. EDDIE JACOBSON: (Non-equity); 50s – 60s; A close friend of Truman’s; in real life paunchy and balding, soft-spoken, under-educated, comes across as an awkward country fellow from Missouri but his easygoing personality makes him a good salesman. BELLA ABZUG: (Non-equity); early 30s – early 40s; Truman’s attorney, an unmistakable New Yorker, born of Russian Jewish parents, with personality galore. Not a shrinking violet, though she’s both advocating for and attacking the former President of the United States. AL SCHWIMMER: (Non-equity); 40s – 50s; Witness for the defense who is a handsome and commanding presence – forceful and confident. Auditioning candidates should have a one-minute dramatic monologue and prior to the audition will be given a section of the script to be performed. For an appointment, please send a headshot and resume to wmspatz@gmail.com.